Male and Female in centre. 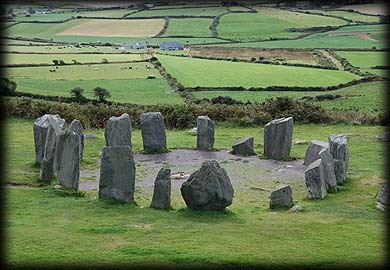 Drombeg is probably Irelands most famous stone circle, it is a recumbent circle with the recumbent or altar stone lying to the south-west. 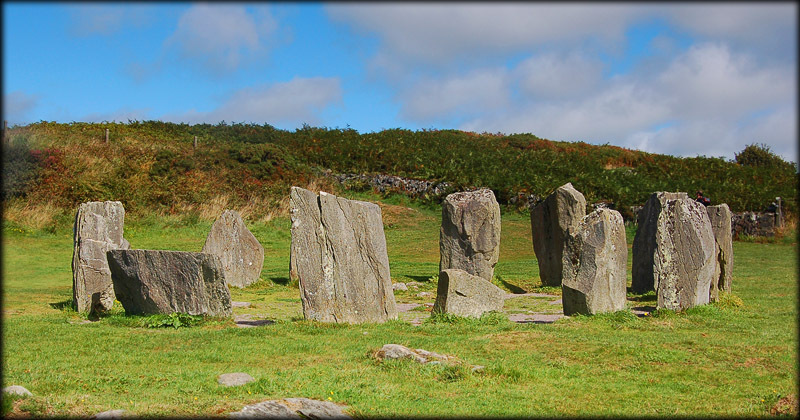 The circle consists of seventeen pillar stones that are graded from the two large portal stones, each 2 metres high, at the north-east towards the recumbent stone. The pillar stones are local sandstone and the recumbent has two cup marks and what looks like an axe -carving on it's upper surface. Towards the centre of the image left are two stones, male left, phallic shaped and the female right lozenge shaped. 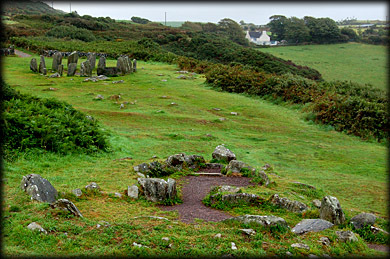 The best time time visit Drombeg is probably early morning as there is an almost continuous flow of visitors to this site. 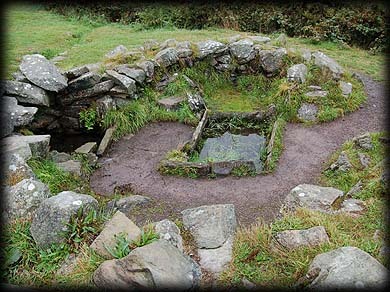 Also present at the site is a Fulacht fiadh a communal cooking pit with a hearth, pictured right. Hot stones were taken from the fire and dropped into the water trough, recent tests have shown they could boil seventy gallons of water in about fifteen minutes. Pictured below are two stone huts co-joined by a doorway. The cooking area is just to the right of these huts. Situated: From Clonakilty take the N71 west to Ross Carberry, just after the causeway take a left turn onto the R597, then after about 4 kilometres take a left turn, sign-posted for Drombeg circle, there is a car park on your right about 400 metres down this road. The circle is a short walk along a track from this car park. Discovery Map 89: W 2461 3521 . Last visit Sept 2012.